The buyer MUST take the entire collection of about 1,500 maps. Interested please PM me I'm not asking much & am willing to take any reasonable offer. 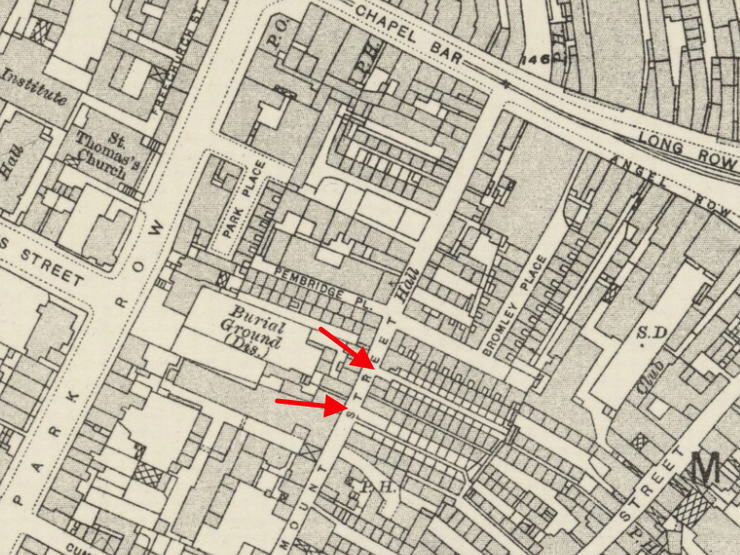 Wondering if anyone has a map that shows Exchange Court on Mount Street? It was there in 1906... not sure how long before or after it might have existed. 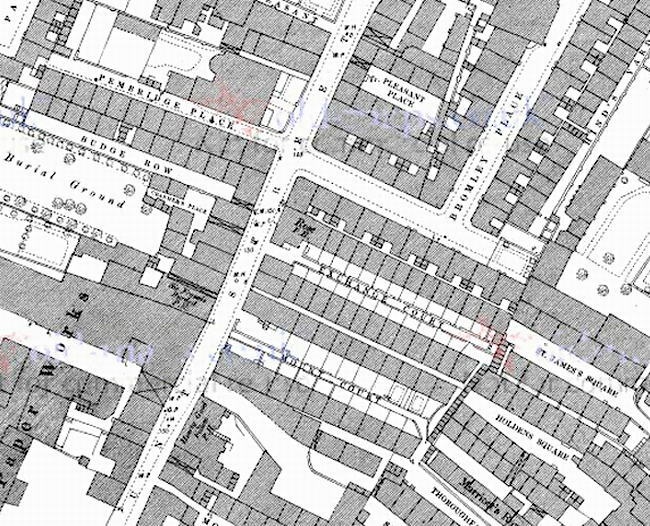 I have 2 copies of the old Nottingham maps, 1881 and 1899, I cant see that place on the map. The area seemed to be mostly factories then. I'm pretty certain it's one of these two, although at the moment I haven't found anything large-scale enough to include names. Bromley Place still exists. Exchange Court is now in the middle of Maid Marian Way at the point where that road bisects Mount Street. Thank you Cliffton, that is great! Is that the Baptist Burial across the road? I understand that's now below a Casino from another thread I read? I can now confirm that Exchange Court is the upper of those two arrows on the map. And yes, it's the same Baptist Burial Ground from another thread ! Thank you! How were you able to determine that? Did you find something somewhere that showed where it was, or just process of elimination? It was a case of eventually finding what I was looking for ! Note that on the corner of Exchange Court is a pub named The Rose, and further down is another pub named The Heart Goodfellow ! That named cropped up again later. Note that on the ﻿corner of Exchange Court is a pub named The Rose, and further down is another pub named The Heart Goodfellow ! That named cropped up again later. You can see that old version of The Hearty in this photo from the early 60s. It's the half-timbered building on the right. 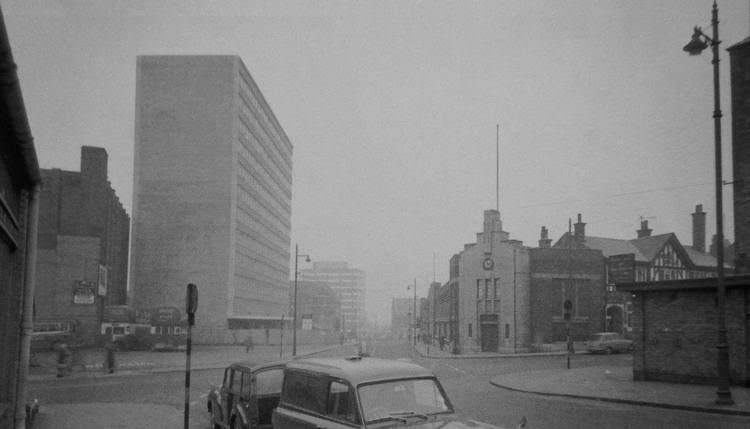 The tower block on the left is still there as the Park Plaza Hotel. Well Cliff Ton has done it again , when I first joined this forum I wrote amongst other things that I was amazed that a question could be asked and before long someone would post a map and quiet possible a photograph, what a forum. Cliff Ton do you give tutorials on how to research items ,if so put my name down. I have still remembered not to get in the way of Carni in the cake queue. I'd also suggest Carni starts doing cake tutorials. I'd go to them. Put mine down as well please Clifton, whenever I Google stuff (well most of the time) i never seam to get the answer I was expecting yet others ask the same question and get what they want !! I believe the map data different people on here actually own, right? I don't think that particular stuff is online... is it? As for photos, I think it takes perseverance and knowing your area. Knowing cross streets, or major buildings as references, and searching them in a Google image search, and then altering some settings in the Image Search, such as showing only Black & White pictures and such. I can sometimes find what I'm looking for, other times is trawling for additional data, or using a forum like this since I'm not intimately familiar with the area to know what landmarks to look for. Google, Facebook, Reddit, Pinterest... you can usually find something specialized somewhere. This site is awesome though, and it comes up in so many of my searching time and time again!! But yeah, i'd read any research hints/tips for sure! !